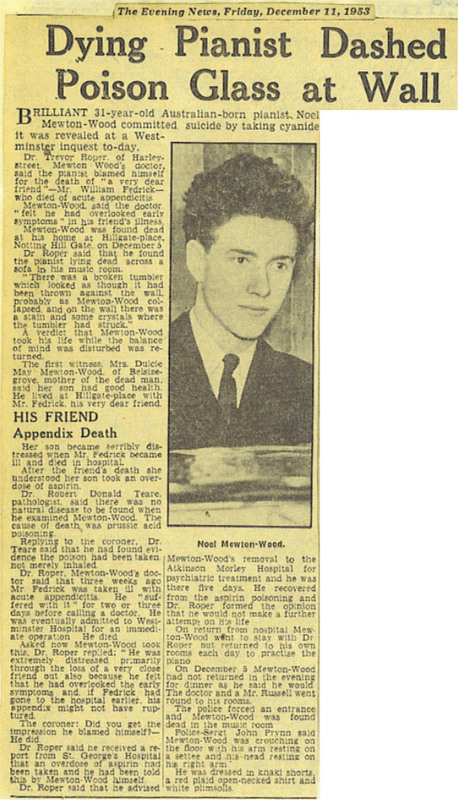 The London Evening News reported Noel Mewton-Wood�s suicide on 11 December 1953. He blamed himself for the death of a "very dear friend", William Fedrick, with whom he lived. This newspaper cutting is in the Lesbian and Gay Newsmedia Archive, at Middlesex University, London. The Australian painist, Noel Mewton-Wood had an enormous repertoire ranging from Weber to Stravinsky. He had a particular interest in Feruccio Busoni's music and performed the five-movement piano concerto on three occasions - twice under Beecham (see below). Arthur Bliss�s Sonata for Piano was composed for Noel Mewton-Wood in 1952. "Noel Mewton-Wood�s (1922-53) journey from underestimated virtuoso to present-day icon is cause for both celebration and irony. Glowing testimonials to his �genius� (Sir Malcolm Sargent) from Myra Hess, Beecham, Schnabel, Bliss, Hindemith and Britten were countered by indifference from the major record labels and concert managements, a situation that doubtless contributed to his suicide at the age of 31. Behind an ebullient surface, Mewton-Wood was a romantic idealist, susceptible to depression and mood-swings. So it is hardly surprising to find the dichotomy reflected in performances which alternate a luminous poetic delicacy with a rare energy and bravura." Arthur Bliss composed an Elegiac Sonnet for tenor and piano quintet, with words set by Cecil Day Lewis in memory of Noel Mewton-Wood after the latter's suicide. It was first performed by Peter Pears, Benjamin Britten and the Zorian Quartet in December 1954. (See also Hyperion CD CDA67188/9). There was a Noel Mewton-Wood Memorial Concert at the Wigmore Hall in London on 28 January 1955, with Peter Pears (tenor) and Benjamin Britten (piano).